When SpaceX managed to safely land its 3rd Falcon 9 rocket ten days ago, Elon Musk tweeted that the company “may need to increase [the] size of [its] rocket storage hangar.” He wasn’t kidding. These photos seem to prove Musk’s point. 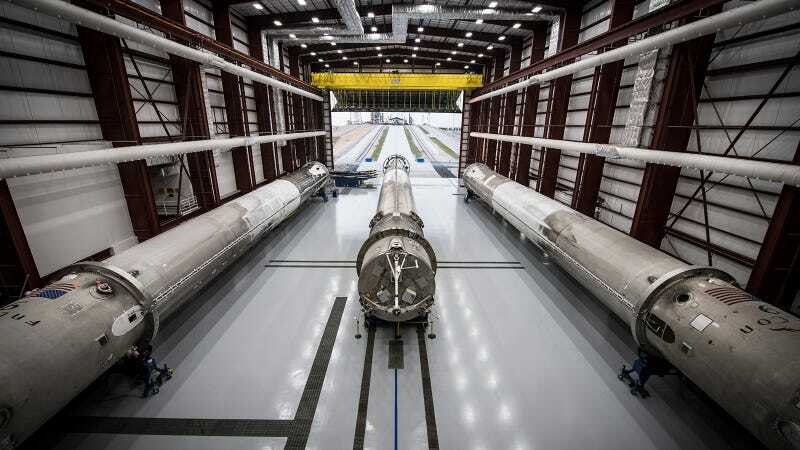 You can see the three landed SpaceX rockets in hangar 39A at the Kennedy Space Center in Florida. And, yes, if they put two more Falcon 9 first stages inside, they are going to have a packed house. SpaceX landed its first rocket successfully at Landing Zone 1, at Cape Canaveral on December 22nd, 2015. The second rocket touched down on the ocean barge named Of Course I Still Love You on April 8th, 2016. And the third one successfully landed on the same drone raft on May 10th, 2016. Why Is the First Ever Production Aircraft in a Modern Wind Tunnel?